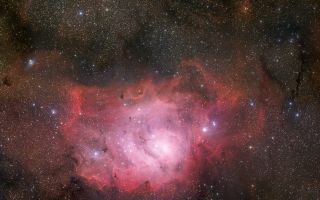 The third image of ESO’s GigaGalaxy Zoom project is an amazing vista of the Lagoon Nebula taken with the 67-million-pixel Wide Field Imager attached to the MPG/ESO 2.2-metre telescope at the La Silla Observatory in Chile. This cool space wallpaper shows the third image of ESO’s GigaGalaxy Zoom project is an amazing vista of the Lagoon Nebula taken with the 67-million-pixel Wide Field Imager attached to the MPG/ESO 2.2-metre telescope at the La Silla Observatory in Chile. The image covers more than one and a half square degree — an area eight times larger than that of the Full Moon — with a total of about 370 million pixels. It is based on images acquired using three different broadband filters (B, V, R) and one narrow-band filter (H-alpha).